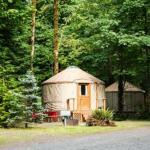 Mount Hood Village Premium Yurt 3 offers pet-friendly accommodation in Welches. The accommodation features a seating area. The nearest airport is Portland International Airport 53 km from the property.